Great news! The trail detour around the I-91 bridge construction has been completed, and the southern trailhead near the Marina Restaurant is now open. The ephemeral spring wildflowers are profuse. It is a good time to get out and explore the Riverstone Preserve and the West River Trail. Photos by Alex Wilson. Over the last couple of weeks we have been able to re-route the part of the trail between the interstate bridge and the trailhead by the Marina Restaurant. Thanks to the generous support of: Adam Winstanley, who permitted us to move the trail on to his property, PCL, the interstate bridge contractor, J. Evans construction, who skillfully built the new trail segment, and several volunteers, we are open at last. The new section of trail passes under the interstate on the hill just below the bridge abutment. This location offers a great vantage point to watch the bridge construction. Today I watched them drilling holes for the new bridge footings. Happy Trails. To access the detour trail from the Marina trailhead, look carefully for a small yellow sign & turn right up the hill. Look closely and take care – the sign is easy to miss. See photo below. 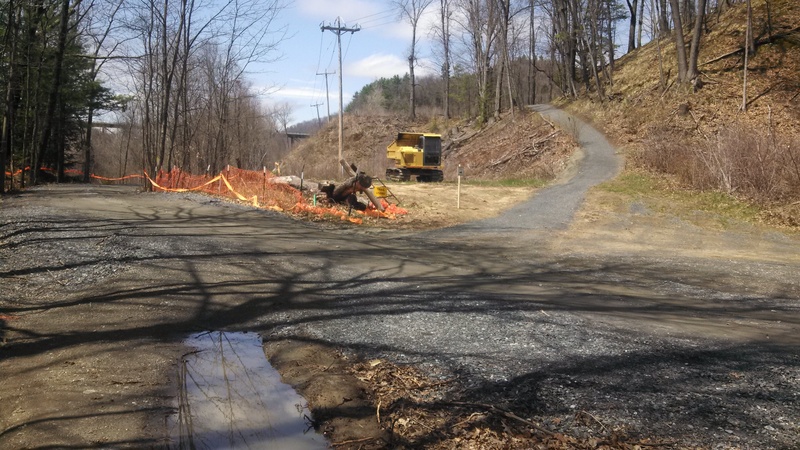 This entry was posted in lower section, vermont, west river trail and tagged I-91 bridge construction, southern trailhead, trail is open, west river trail. Bookmark the permalink. I was so excited to get this email that I set out on a walk. I have to say that the trail was mighty confusing. It seems to peter out just as it’s heading to the bridge underpass. Is this the end of the trail for now? There were no further signs and one is left entirely confused, at least I was, at this point. I road the trail today and it was gorgeous! Thanks for building the detour.